I did some planning for my PCT hike in 2017 today. I am using Craig's PCT Planner. I had started using this a while back when I was reading Wired's blog about her PCT trip in 2011. I could not remember my password for logging into Craig's planner. I tried every password I could think of, no success. So I tried to use the forgot my password feature and did not get any response. Finally I used the Feedback feature and emailed Craig giving my name and login (which I did remember) and my email address. I explained that I couldn't remember my password. I didn't know how long it might take for Craig to get back to me. It was pretty cool, he emailed me right back and informed me that I had used a different email address, doh! It is lots of fun to go through the different resupply scenarios and refer to Yogi's PCT Handbook to review the different resupply points. I have a much better idea of my pace after the 2 day trip I took from Echo Summit to Donner summit. I am using that pace as a baseline to calculate my days on the trail and zero days. It's quite fun and engaging. 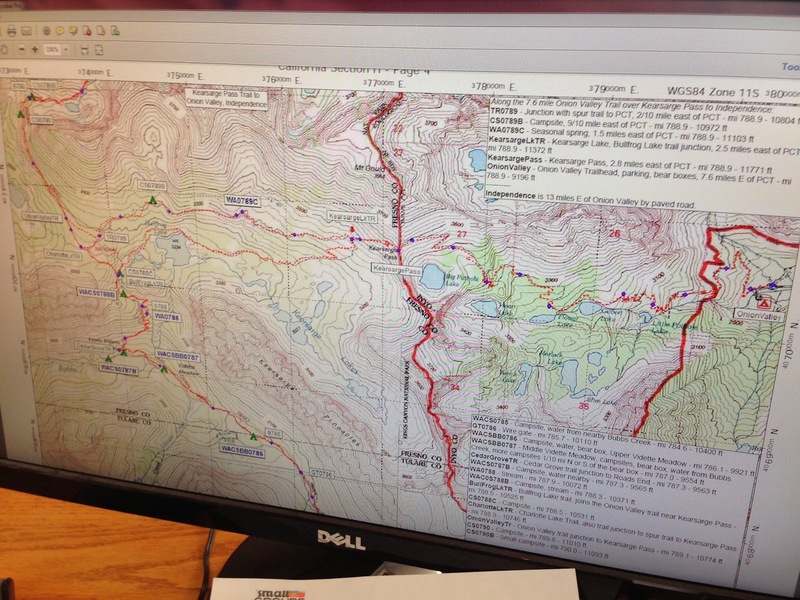 I am using Half Mile's maps to review the trail at different points to determine if I want to resupply at different points. It looks to me that the diversion over Kearsarge Pass to the Onion Valley trailhead is a key resupply point because of the distances and difficulty of the trail in that part of the Sierras. Even those it adds an additional 15 miles of hiking and an unknown hitch-hike down to Independence, it is better than the alternative of carrying all of the extra food to reach a more distant resupply point. I am considering taking a serious zero day in either Independence, Lone Pine, or Bishop. I am imagining swapping out the weight of the extra water that I will need to be carrying through the deserts of Southern California for additional days of food to make it through the remote high-country of the Sierras. I also have decided to climb Mt Whitney will I am in the area as PCT hikers are authorized to do that as long as they climb and descend it from the West side. That adds another day and 17 miles of hiking. This whole process is an interesting and fascinating project, I am really enjoying it. On a different note, I joined the PCTA this week and made my donation to support their efforts to keep and protect the PCT. Maybe I'll even join one of their trail maintenance projects next summer. I am grateful to all of the people who have done so much to make this trail possible for me and I want to it to be around for my grand-kids in case they ever decide to follow in ole grand-dads footsteps.